The premier Brooklyn-based jewelry designer, Freida Rothman, specializes in luxury jewelry and accessories ranging from rings to necklaces. Freida Rothman jewelry is a lifestyle brand that is known for its focus on eloquent layered necklaces, bracelets, and stackable fashion rings. Taking influence from one of the fashion capitals of the world New York, these pieces convey both the tough and stylish sides of the Big Apple. They are most notable for their matte metal finishes and two-tone colored metals, capturing the designer’s ability to stand out from the ordinary with its industrial glamour sense of style. This award-winning brand is available in Toms River, New Jersey at the esteemed jewelry store Corinne Jewelers. Freida Rothman boasts an extensive selection of fashion jewelry in some of the most elegant and sophisticated jewelry collections. The FR Signature is one of Freida Rothman’s more prominent collections with its timeless appeal and ability to really elevate your look. Every season, this collection is updated as it introduces current and in-style designs and pieces which layer and stack beautifully. For the fashionista who wants to be in the know, and stay on top of the ever-changing fashion trends, the FR Signature is the collection to follow. Express your individuality as you mix and match these beautiful jewelry pieces to curate your very own look. Expressing the softer side of New York, the Fleur Bloom tells a playful and whimsical story in fashion jewelry with a lighter color palette and cooler hues. As this season shows off brighter color palettes, this collection enters with a more modern flair for any Spring soiree. Pieces of this collection contain a playful and airy design with delicate femininity, highlighted by silver and gold accents with clear stones and mother of pearl. For a calm combination of warmth and subtle illumination, these pieces are essential. Freida Rothman also presents the Industrial Finish collection, with bolder and more daring looks and designs. Based on the confident energy and architecture of Brooklyn, from chain link fences to buildings of dark gray and black hues, these pieces symbolize the toughness and grit of the city. 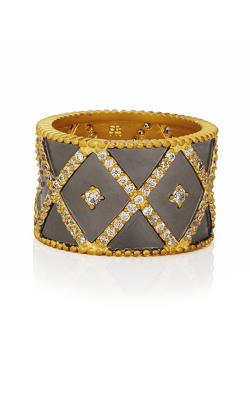 Why Shop for Freida Rothman at Corinne Jewelers? Located in Toms River, New Jersey, Corinne Jewelers is happy to serve the local cities of Point Pleasant, Bayville, Bricktown, Forked River, Beachwood, and more. With over 50 years of experience in the jewelry industry, our experts are happy to help you find the dream jewelry piece you have been searching for. We believe in quality jewelry from only the top designers with exceptional customer service, and we guarantee that you will never pay more at Corinne Jewelers than you would anywhere else. Merchandise in its original condition can be returned for a 100% money back guarantee, so you can rest easy when shopping for the one that you love. Experience the best in jewelry service and the finest in fashion and bridal collections at our showroom today!